The 2013-2017 Accord is one of the best mid-size cars. It comes as a front-wheel drive coupe or sedan. Compared to the previous generation, the 2013 Accord is a bit smaller. It handles well and is one of the most fuel-efficient cars in its class. 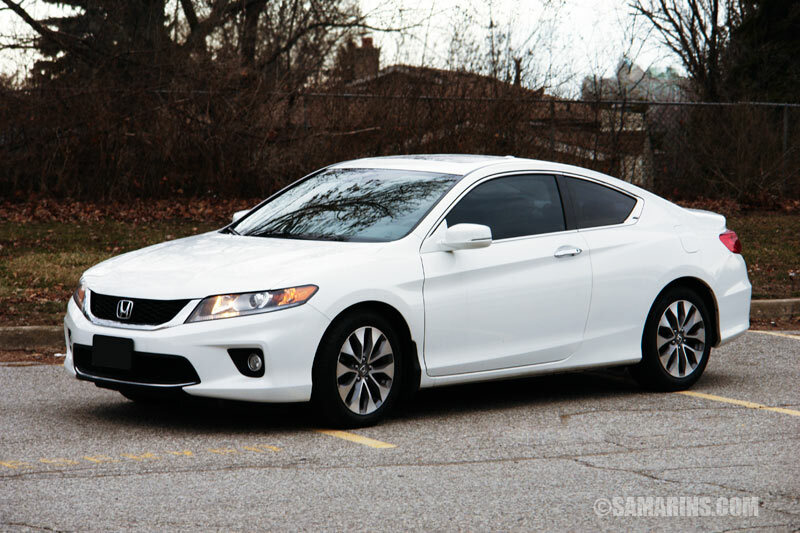 The Accord Hybrid (not covered in this review) is available form 2014. Engine choices include a 185-hp inline-4 and 278-hp V6. A 6-speed manual is available with either engine, but rare. The most common configuration is the 4-cylinder engine with a CVT automatic transmission. V6 models offer a conventional 6-speed automatic. The Accord is rated above average for reliability, but there are a few problems to watch out for, read below. Read also: Pros and cons of buying a car with a CVT transmission. Honda Accord 2.4L K24W 4-cylinder i-VTEC Earth Dreams engine. 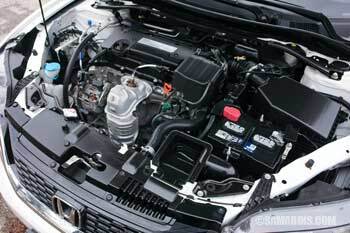 K24W Earth Dreams Engine: The primary engine choice is the 185-hp 2.4L K24W Earth Dreams DOHC i-VTEC. It's a different engine from the previous K24 of the 2012 Accord. In the K24W the intake is now placed at the back, while the exhaust manifold is at the front. The K24W engine has the higher compression ratio (11.1:1) and direct fuel injection. How a direct fuel injection works: A conventional low-pressure electric fuel pump delivers the fuel from the tank to the mechanical high-pressure pump that is driven by the exhaust camshaft. The high-pressure fuel pump supplies the fuel under high pressure into the fuel rail. Then the fuel is injected directly into the combustion chambers. Compared to the previous engine, the K24W is more complex, but lighter and more fuel efficient. It's a bit early to know the long-term reliability of this engine, but so far, there are very few reported problems. To keep the engine in good shape, keep the oil level topped up between oil changes; there is no warning light or message to alert about the dropping oil level. 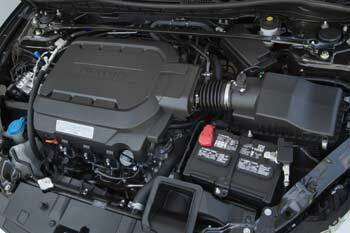 J35Y Earth Dreams V6: The optional 278-hp 3.5L V6 J35Y Earth Dreams is a SOHC VTEC engine with direct injection and Variable Cylinder Management or VCM (in automatic models). The VCM disables the rear bank of cylinders under low and moderate load. The idea is great, you drive on 3 cylinders when driving steady, but the V6 power is instantly available when you need more power. Technically it's done by closing the intake and exhaust valves of the rear bank of cylinders. The VCM is operated by oil pressure and controlled by two spool valves. Thanks to the VCM, the V6 Accord offers the best highway fuel economy among V6 cars. Fuel Economy: The Accord is one of the most fuel-efficient mid-size cars with a conventional gasoline engine. The 2016 and 2017 Accord 4-cyl. auto is rated at 27/36 MPG or 8.7/6.5 L/100 km city/highway on regular gasoline. With 80% highway driving, the 2017 Accord can travel up to 585 miles or 941 km on a 17.2 gallon (65 liters) tank. The 2013 and 2014 Accord 4-cyl auto get 26/35 MPG. The EPA rates the 2014 and 2015 Accord V6 at 21/34 MPG. Handling and ride: The ride is on the firm side, but comfortable. The car holds the road well on the highway and at city speeds. The turning diameter (38.1 ft. for 2013 sedan) is a bit large, but we didn't have any issues. The steering is well-centered and precise. The 4-cylinder model we drove offered enough power for normal driving. The CVT feels similar to a regular transmission. Of course, driving enthusiasts may prefer the 278-hp V6 that comes with a conventional 6-speed auto. Timing belt or chain: The 2.4L K24W 4-cylinder engine has a timing chain. The 3.5L J35Y V6 comes with a timing belt that needs to be replaced after a certain mileage. Honda doesn't specify the recommended mileage for timing belt replacement. Instead, Honda relies on the Maintenance Minder (MM) system, where the timing belt in a V6 engine is included in the MM Sub-Item 4. According to some Honda owners the Maintenance Minder Sub-item 4 message comes on soon after 100K miles. Pros: Handling, safety features, stylish look, good engines, crash-test ratings, fuel economy, strong optional V6, available with manual, holds its value well. Cons: Road and wind noise, some owners find the driver's seat uncomfortable, undersized battery in 4-cyl models, paint chips easily, electrical issues. Problems: A weak battery or corroded battery terminals can cause variety of problems, including lack of steering assist, no start and other electrical issues and warning lights. On top of that, the battery in the 4-cylinder Accord is fairly small. Replacing the battery costs from $135 to $210. There was a recall to replace the 12-volt battery sensor. Check the NHTSA website for more info. A starter motor can fail. The early symptom of a failing starter motor is when it turns over the engine only after multiple attempts. Replacing a starter motor will cost from $360 to $520. We checked online part prices. An aftermarket starter is cheaper ($130-$150, plus delivery and core return), an OEM starter is more expensive online ($390-$450). The replacement is not too difficult, see these Youtube videos. As a separate issue, the Honda TSB 16-002 describes a problem with the starter motor in the 2013-2015 Accord V6 auto, where it makes a grinding noise at startup. The repair involves replacement of the starter motor and repositioning of the torque converter. Several Honda Accord owners mentioned the wind noise coming from the door. Honda issues the TSB 15-087 on this issue. Of course, performing this TSB will reduce the noise but will not eliminate it completely. See these videos. We found several reports that the infotainment system / navigation / reverse camera freezes or stops working. Some owners say that the dealer reset the system by disconnecting the battery to solve the issue. Several owners reported that the software update at the dealer fixed the bugs. In some cases, the reverse camera or the infotainment system unit had to be replaced. 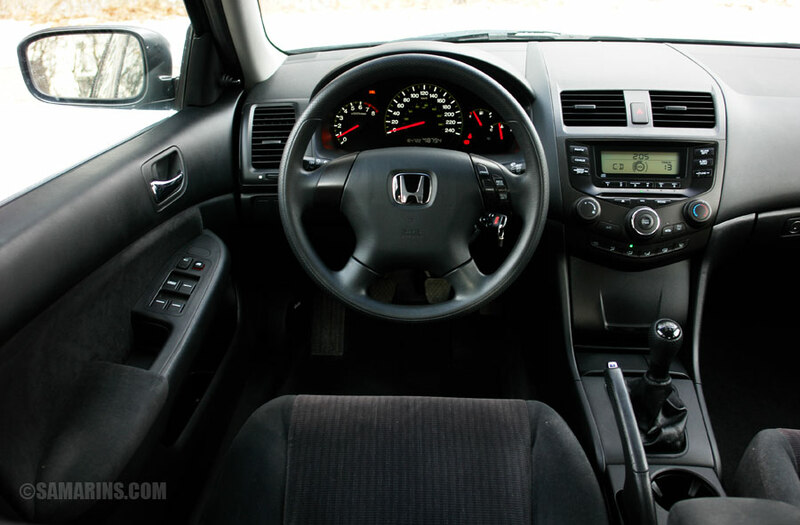 We should note that problems with the infotainment systems are very common in many modern cars and not limited to Honda. There is a number of complaints at the NHTSA website about the LED DRL light burning out inside the headlights in the 2016 Accord. This is also a common problem in many modern cars. The repair involves the replacement of the headlight unit, which is quite expensive if not covered by the warranty. There are aftermarket headlight units available for $169-$300 online at Autozone or RockAuto. An OEM part is more expensive. We also found a few Youtube videos describing the problem and DIY fixes. What to look for when buying a used Honda Accord: Watch out for problems with the starter. The car should start on the first try without grinding or other noises. If the battery is old and needs to be boosted, it might have to be replaced soon. Check both headlights; if the LED DRL is dim or flickering, the whole headlight unit might need to be replaced. See if the reverse camera, navigation and other features of the infotainment system are working. Watch out for warning lights or messages that are staying on on the dash after the vehicle is started. Some problems might be expensive to fix; for example the Forward Collision Warning system. Watch out for signs of oil leaks under the vehicle. During the test drive, see if the CVT transmission "shifts" smoothly when accelerating from a stop. Watch out for a delay when the transmission is engaged or a shudder during acceleration. Check with a Honda dealer if all the recalls and campaigns have been completed. This forum DriveAccord.net has some useful info. Read also: What to look for when buying a used car. Overall: Despite the problems mentioned above, the Accord is still one of the best mid-size cars on the market. Many other family sedans have even more problems. Consumer Reports rates the Accord well too. The majority of reported problems are related to 2013 and 2014 models. Read also: Is the CVT transmission reliable? Among competitors, we would recommend Toyota Camry and the 2014+ Mazda 6. Maintenance: Given the oil consumption issues in modern cars and the complexity of either engine, it's vital to keep the engine oil at the proper level between oil changes. Running the engine low on oil will cause it to wear faster. This means, check the oil level regularly and top up as needed. There is no warning light or message for the low oil level. Checking the oil level is easy. Read our maintenance checklist with illustrations. The Owner's manual for the 2015 Honda Accord recommends checking the battery terminals for corrosion monthly. If terminals are corroded, the car may fail to start or the electric power steering might work intermittently. If you need an owner's manual, here is the link: Where to find an owner's manual. Honda Accord Safety ratings: The NHTSA awarded the 2013-2017 Accord with the 5-star overall rating. The 2-door coupe scored better: it got 5 stars in the front and side crash test and 5 stars for rollover resistance. The Accord 4-door sedan received 4 stars in frontal crash tests and 5 stars for side protection and rollover resistance. The IIHS awarded the 2013-2017 Accord coupe and sedan with the Top Safety Pick rating.